1. How'd you first get interested in bicycles in general? Nothing like a bicycle to get one out of... the house,away from dicplinary parents and combatitve siblings. Bicycles always represented freedom for me as soon as I got one. 2. At what point did you begin building bikes? I built my first frame in 1978 when I had been a bicycle mechanic for two years. I wanted a good frame but also wanted the experience of building a frame. Framebuilding represented the final frontier of knowledge for a bicycle mechanic. 3. What were some of the challenges you faced when you first started out building bikes for people? Getting a customer of any kind was the first challenge. When I started building frames nobody knew that you could get a frame built by a guy in the states, rather than from some european or Japanese company.....or Schwinn. The next challenge was being able to build a frame and not go crazy with frustration. 4. 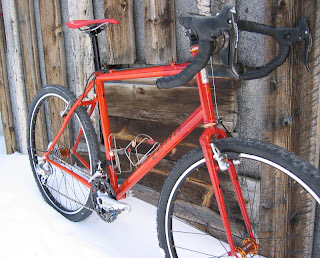 How is your approach to build a cyclocross bike different than say in building a mountain or road bike? I build cyclocross bikes with the idea of making a bike that can be ridden really fast and be stable and remarkably un-scary. That is my quest with just about any frame but it is paramount with 'cross frames. 5. Whats your favorite bike that you own or have owned? What made it special? The bike that I rode today was my favorite today. It might be different tomorrow. 6. Do you race cyclocross? I do participate in 'cross races but I am usually so lousy at it I am reluctant to call myself a real racer. I have a really good time doing it, though. 7. 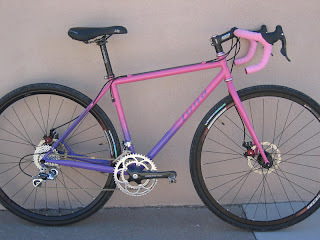 In your opinion, why are custom steel cyclocross bikes still so popular? Steel works really well for 'cross frames as long as the frame isn't underbuilt. Steel is inexpensive and easiest to work with and very durable making it a good choice for 'cross. 8. 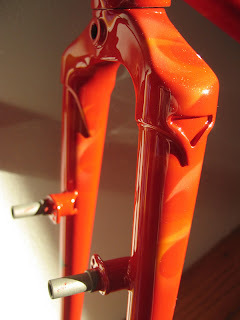 Whats your current wait time for a custom cyclocross frame? 9. Is there anything else you think readers would want to know about your approach to bikes, cycling and building frames? I listen to riders who race at the highest levels of 'cross to help me build better bikes. I also listen to just about anybodys feedback concerning my frames in general....not listening to people is death for a framebuilder in my opinion,for what it's worth. 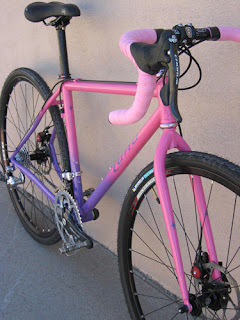 This one goes out to all the ladies...Luna Cycles makes some sweet female specific rides. 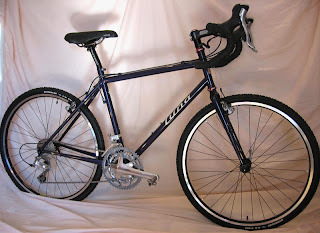 In 1995 I closed my retail bike shop, then I took a general welding class, then went to UBI and learned frame building and brazing with lugs from Ron Sutphin and tig welding with Gary Helfrich . It depends on the particular bike and the customer. Usually the customer wants a cx bike to be as versatile as possible. 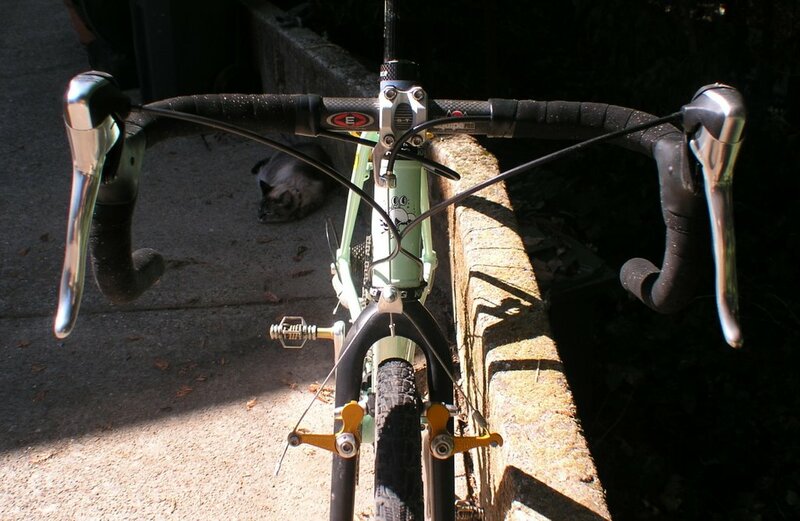 Usually a bit higher of a bottom bracket than for a road bike, and a bit higher front end overall. Mud clearance is obviously very important. Adequate standover clearance is important. Usually room for fenders. I also tend to get approached by women on the short end of the spectrum...5'4" or shorter, for whom the stock 'cross bikes don't fit, either from a standover perspective, or a reach perspective. I build many small 700c wheeled cross bikes, and I build a lot of 26" wheel, cx-legal bikes--usually with 26 x 1.3 knobbies, or narrower. My current "cross" bike. Not a true cyclocross machine in that it has a triple and will never be raced. But I live where it is all dirt and all hills, and love a road position on the dirt. I really like the paint, and naturally the fit--much less assertive and more playful position than my road bike; I used an old Columbus Genius tube set that was starting to gather rust in my shop, which is beautiful and durable, and made a straight-blade custom steel fork that matches it perfectly. It is about half tig welded and the other half brazed....It is very light and lively, and very comfortable. Not now, but I did do a few or more lung busting cx races back in my racing days. Because they are versatile, comfortable, and always beautiful. 8. 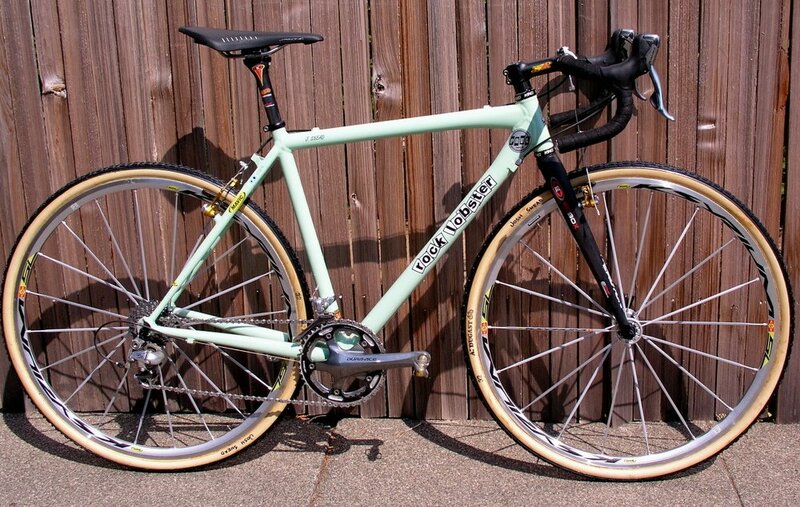 What’s your current wait time for a custom cyclocross frame? For frame only or frame and fork, it is about 10 weeks. Complete bikes are also an option. I am a specialist for the small rider, and have a lot of experience building for women.... and I tend to think outside the box.